HOLLIDAYSBURG — Throughout the Hollidaysburg girls soccer team’s preparation for its District 6 3A semifinal match, the coaching staff stressed starting strong and finishing plays. The Lady Tigers achieved both, scoring a goal 1:03 into the game and adding four more for a 5-1 win over Huntingdon Monday at Tiger Stadium. “We had a week to prepare. I told them all week we’ve got to start fast and finish. 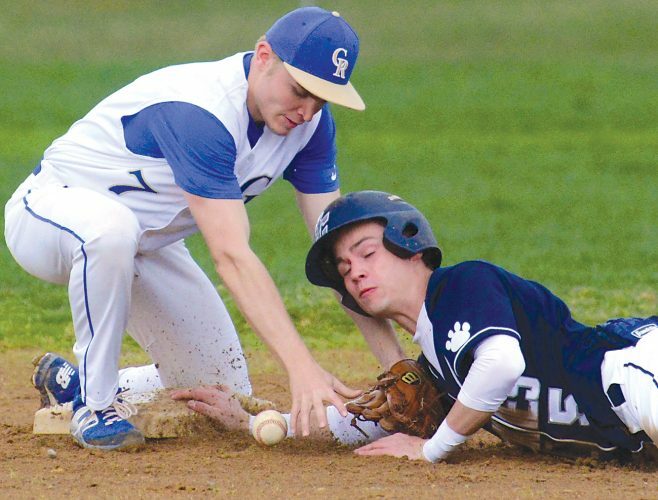 We came out and accomplished what we wanted to do,” Hollidaysburg coach Dave Soellner said. Seniors McKenna Hurd and Sydney Routch each scored a pair of goals, and freshman Rita Kendziora added a goal and an assist to help Hollidaysburg advance. The top-seeded Lady Tigers play second-seeded Somerset for the district championship 5:30 p.m. Wednesday at Mansion Park. Huntingdon’s season ends at 9-7-1. Hurd and Kendziora got Hollidaysburg on the board early, combining on a goal 63 seconds into the game off a corner kick. Hurd scored again midway through the first half to give the Lady Tigers a two-goal advantage. Kendziora started that play as well with Jenna Heim getting the assist. “Rita crossed the ball in. I tried to shoot it but kind of whiffed. Jenna tapped it back over to me. Their keeper came out to defend Jenna, and I put it in,” Hurd said. Hollidaysburg increased the lead to 3-0 on a Sydney Routch goal with 8:04 remaining in the half. “Sidney Pohar sent me a long ball. I ran past the defender and cut her off to the side. I kept running on the side. The goalie came out at the near post, and I put it at the far post where she couldn’t get it. It went right under her,” Routch said. The three-goal halftime deficit did not take the fight out of Huntingdon. The Lady Bearcats scored a goal 1:11 into the second half on Rachel Gwinn’s shot from the left side of the goal box. “We have a very tenacious team that’s all very young. I wasn’t really worried when it was 3-0. I told them at halftime 3-0 is not a lead we can’t overcome,” Huntingdon coach Michael Armstrong said. The next goal would be the difference between a competitive 3-2 game or a comfortable 4-1 cushion. “We had a little lull to start the second half. We came back and dominated the next 7-10 minutes. We were making the runs, doing the right stuff and eventually got that fourth goal,” Soellner said. Kendziora made it a 4-1 game with 16:21 left in the game when she put in a rebound off Sydney Routch’s direct kick from 30 yards out to the left of the Huntingdon goal. The high-arcing shot went off the Huntingdon keeper’s fingertips and the crossbar before Kendziora tapped it in from in front of the net. Routch added another goal with 1:37 remaining to cap the win. First half: HO–Hurd (Kendziora), 38:57; HO–Hurd (Heim), 17:52; Routch (unassisted), 8:04. Second half: HU–Gwinn (unassisted), 38:49; HO–Kendziora (Routch), 8:04. HO–Routch (Bell), 1:37. Records: Huntingdon (9-7-1); Hollidaysburg (14-4-1).